Roses are perfect for creating a quintessential romantic English rose garden and are one of the most versatile plants for any setting. You can incorporate these ‘queen of flowers’ into your garden whatever its size or style – whether traditional or contemporary. With their wide variety of of colours, sizes and growth habits, they can be incorporated as part of a cottage garden style, in formal beds, draped over arches and walls, or planted in patio containers. Thinking of incorporating a rose garden into a new garden design? Find out how to plan, design and cost your garden transformation. Creating a beautiful rose garden scene needs careful planning. Begin by assessing your garden’s micro-climates and conditions. Decide colours and style of flowers to suit your taste, the style of your house and garden, the conditions, and what effect you are aiming to create. Ideally try to see roses in bloom by visiting specialist nurseries and rose gardens during the flowering season. Whether you want to add some roses to your existing garden or start a garden from scratch, sketching out a diagram is helpful, as is deciding whether you want roses on their own or mixed with herbaceous plants or shrubs. Roses will grow in most well-drained soils, but incorporate some well-rotted compost or manure before planting. The majority are fully hardy and prefer a sunny position – although will do well if they get five or six hours of sun a day and are placed in an open position. Some roses grow in shade, so they can be selected for different situations. The most economical way to grow roses is to plant bare-root plants from late autumn to early spring. Water well until established and feed often in spring, followed by mulching with organic matter to retain moisture and suppress weeds – but not close to the stems. If you choose rose varieties that repeat flower in flushes from June to the first frosts, this allows a succession of combinations with your annuals and perennials that also keep blooming, such as phlox, lilies, penstemons and salvias. For a formal rose garden, design a series of beds and interesting paths; keep in mind that more beds mean more maintenance. Plan a geometric layout of square, rectangular or round beds, but keep the design simpler for smaller spaces. Enclosed beds edged with low, neatly clipped hedges of box, myrtle or privet, are a classic choice. The hedges will hide the bare earth and lead the eye straight to the flowers. Species or wild roses – mostly single flowered that like to sprawl in a natural style, many have colourful hips in autumn; includes rugosa, glauca, moyesii and canina. Old Garden Roses – dating from before the 1860s, these large graceful shrubs with mostly one flowering are richly fragrant; includes alba, gallica, damask, cabbage and moss roses. Modern Roses – bred from the early 20th century, these repeat-flowering varieties include floribundas, hybrid teas, landscape, climbers, miniature and David Austin English roses, which combine flower and fragrance of old roses with wider colours and repeat flowering of the new. Shrub and modern roses are ideal choices, as are standard roses. For a strictly formal garden design include roses alone, carefully positioned, planted quite close together and mulched, then trained and trimmed to conform to the design. For a more casual touch, underplant roses with a controlled colour scheme of shallow-rooted annuals, perennials or tiny bulbs. If the plants chosen are lower than the rose bushes, their roots will not compete, and the formal look won’t get lost amid a tangle of growth. Use our guide to choosing plants for your garden to get more advice. An elegant focal point of an urn, statuary or a water feature will complete the scene. Large pots of standard roses could punctuate each bed or be placed at regular intervals along the framework. To add an element of height, include climbers, arbours, pillars or tunnels, and position seating to enjoy the scene through summer. Read our guide to creating a vertical garden for more design advice. Rose garden companion planting: which plants work well alongside roses? Traditionally the ground around plants was left bare in dedicated rose gardens, with just mulch to cool the roots and feed the plants. Including some pretty companion planting, though, looks pretty and can help to keep down pests and disease. For instance, feverfew draws aphids, marigolds and chives repel pests and insects, and garlic protects from pests and helps prevent fungal diseases. A fringe of lavender as hedging or as a ribbon of colour inside the low hedges will soften the rigidity of a formal rose garden design and could be echoed by planting around a central focal point. Topiary is another perfect companion and will provide structure when the roses aren’t in flower. For a uniform look, try one kind of ground cover. Sprinkle the area beneath the roses with alyssum or dwarf Virginia stock seeds for a do-it-once solution, as these frothy annuals will self-seed. White erigeron and alyssum make a good foil for colourful roses. Silver or grey ground covers, such as cerastium, look elegant in a formal scheme. Iceland poppies under roses fill the space with colour in early spring, and then the roses come back into bloom. To keep interest over a long season, underplant the roses with low-growing spring bulbs, such as grape hyacinths or scilla, which will flower when the roses are not at their best. Alchemilla mollis makes soft mounds under the bases of roses, adding texture. If you’d like to mix roses in borders and beds for an informal, eco-friendly garden style, interplant with low shrubs, bulbs, climbers, annuals and perennials that like the same amount of sun and water. Consider the colours, textures and shape combinations and ensure there is still good air circulation around the roses. The trick is to plan a succession of interest from flowers and foliage. Think about when the roses are in flower and when they are not and you want to camouflage bare stems. Companion flowers that bloom at the same time and are classic choices include geraniums, peonies, forget-me-nots, delphiniums, irises, poppies, lavender, nepeta, campanula, lupins and clematis, poppy and ornamental grasses. The most romantic roses for an informal rose garden are ones with a wild habit. There is an array of cupped, fragrant old-fashioned-looking options, many of which are actually modern, such as the English roses. Rather than being tightly pruned, they are allowed to grow into larger, more natural shapes. For a long succession of flowers, include some spring-flowering floribunda that can bloom continuously from spring to autumn, or the prolific Rosa banksiae ‘Lutea’, which blooms spectacularly once in May with sprays of small primrose yellow flowers. Follow your display with the first blooms in summer and second flushes late in the season, and add extra autumn interest from a few spectacular hip varieties, such as Rosa moyesii and the rugosas. Complete the look with ramblers, which flower once, or repeat-flowering climbers on supports or arbours. All roses are resilient. A rose will not be killed by inappropriate pruning. ; the worst outcome is that it may not produce any flowers that year. Prune the plants in February or March when they are bare of leaves, with clean, sharp secateurs. In general, reduce the size of the bush roses by about one third, give ground cover roses a light trim, and cut back climbing roses after flowering to suit the structure they are covering. Wild roses, such as rugosas, need no annual pruning - just cut away the dead branches from the underside of the shrub every few years. A midsummer tidy-up will help reinvigorate tired roses and encourage a second flush in autumn with repeat bloomers. For specific pruning advice on each type of rose refer to the RHS website, which lists the steps for different types of roses. Be vigilant with your maintenance. Tidy up any fallen leaves and keep your roses well fed and pruned to help them bloom to their best – use our garden maintenance checklist for more handy tips. Don’t plant where roses have been before to prevent replant disease. If you have to spray there are organic options for aphids and thrips, but for some conditions you may need chemical sprays. Deadhead, especially varieties that set hips, as setting seed saps energy for flower production. Watering well can encourage flowering again. Hard pruning in late winter helps to encourage the roses back into action. Feed during or towards the end of the first flowering to boost another flush. Horizontal training of climbing roses encourages more flowers. Plant three of the same variety close together to form one fine shrub. ‘American Pillar’ – A very hardy, vigorous long-lived climbing rambler that is fast growing with glossy foliage. It blooms once spectacularly with dense sprays of flowers in midsummer, is best grown in full sun but tolerates some shade and is drought resistant. It has little fragrance, but it is a good choice for walls, arbours, or other structures -grow on its own or it will smother other climbers. ‘Darcey Bussell’ – A David Austin English shrub rose which is repeat-flowering with a fruity fragrance. With compact growth it is lovely in the border, in a dedicated rose garden, for hedging or in containers. The richly crimson full blooms look lovely with mauve nepeta and lime green Alchemilla mollis. ‘Constance Spry’ – This beautiful rose was the first of David Austin’s and introduced the myrrh fragrance to the English roses. Flowers once in early summer and has strong growth. It can be grown as a climber with easy to train flexible canes, making it ideal for fences, walls, trellises and pergolas. It is best in full sun but tolerates some shade. ‘Just Joey’ – An elegant, continuously flowering hybrid tea with large fragrant blooms of ruffled petals. Disease resistant and with attractive mahogany-tinted foliage, its compact habit makes it ideal as a border plant, massed together and in containers, while the blooms make good cut flowers as well. Ensure that it gets plenty of sunlight. ‘Nevada’ – Creamy white semi-double blooms, which open fully to show their deep yellow stamens, smother this shrub rose early in the season, and then it flowers intermittently through summer with showy red or purple fruits in autumn. Grows best in full sun and is tolerant of poor soils. ‘Graham Thomas’ – A strong, vigorous David Austin English shrub rose with perfumed yellow cup-shaped blooms, which flowers almost continually through summer into autumn. Plant in groups to form a large bush in the border, or it is also available as a climbing rose. Voted the world’s favourite rose. ‘Rambling Rector’ – An abundantly flowering rambler with a delicious fragrance from the sprays of small semi-double flowers that make a magnificent sight, then followed by masses of red hips in autumn. This is one for a large space, scrambling up a tree or on a strong support. The plant prefers full sun but will tolerate some shade. ‘Gertrude Jekyll’ – Twice voted the nation’s favourite rose for its abundant rich pink rosette blooms and old rose fragrance, it is repeat-flowering, very healthy and reliable. It grows in sun or part shade and looks pretty planted among billowing perennials. ‘Twist’ – A patio climber with a blaze of small delicately scented flowers through the season and dark green foliage. It is ideal for a large container or small garden and has excellent disease resistance. Reaches a height of 1.5m. Grow in a sheltered, sunny spot. Underplanting suggestions include tiny white alyssum, viola and calibrachoa. ‘Rosa Mundi’ – An old rose with a delicious old world fragrance that is a mutation of gallica, and because of its natural disease resistance it has lasted well through the centuries. It makes a stunning sight at the height of summer with its distinctive flowers and makes a pretty informal hedge. ‘Coral Flower Carpet’ – One of the best ground cover ranges with clusters of repeat flowering blooms. Disease resistant and easy to maintain – just shear back by one third in early spring. Drought and low-water tolerant. Once established they can provide up to two thousand flowers from late spring to autumn. Mottisfont Abbey – walled rose garden with one of the best old rose National Collections. Romsey, Hampshire SO51 0LP. David Austin Roses – display garden with the largest collection of David Austin roses, and plant centre. Albrighton, Wolverhampton WV7 3HB. Coughton Court – rose labyrinth with 200 varieties. Alcester B49 5JA, Warwickshire. 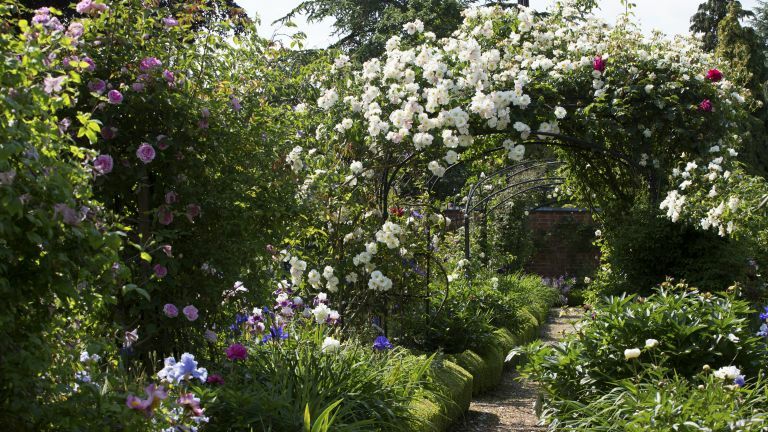 Sissinghurst Castle – famous white garden with roses and herbaceous. Cranbrook, Kent TN17 2AB. RHS Garden – modern roses in the Queen Mother’s garden. Rosemoor, Torrington, Devon EX38 8PH.